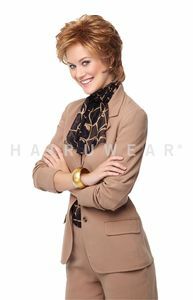 This cool, light and layered collar-length shag works as well in the boardroom as it does on the boardwalk! The hand-knotted top and sheer lace front offer off-the-face styling options. 34C, 305C, 511C, G4+, G6+, G8+, G10+, G11+, G12+, G13+, G14+, G15+, G16+, G19+, G20+, G27+, G29+, G30+, G38+, G56+, G60+, G630+, G811+, G829+.